Solar cycle paths – the way forward? Last week, the world’s first solar cycle paths were opened in Holland: ‘Starry Night’ near Eindhoven and SolaRoad in Krommenie. The cycle paths use two entirely different technologies to generate solar energy, but are solar cycle paths a crazy idea or the way forward? asks Holland-Cycling.com’s Hilary Staples. 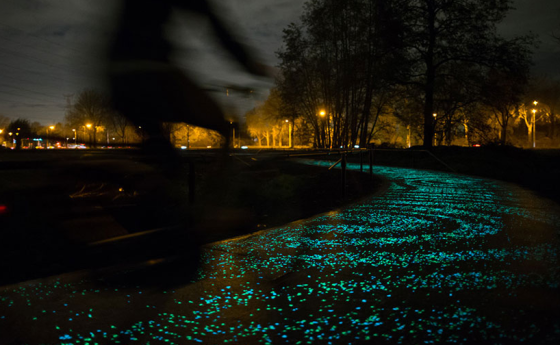 Starry Night near Eindhoven is both a functional cycle path and a work of art by Dutch artist Daan Roosegaarde. It’s inspired by a painting by Vincent van Gogh. The opening of the cycle path marks the start of the celebrations for the 125th anniversary of Van Gogh’s death in 2015. The glow-in-the-dark cycle path uses light-emitting techniques: light stones are charged during the day and emit light during the evening. This not only lights up the cycle path, but also creates the impression of cycling through Van Gogh’s eponymous painting.. 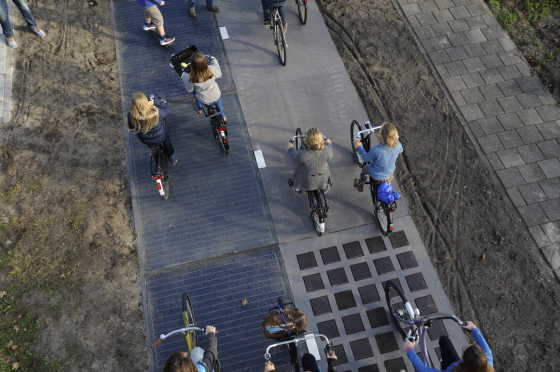 The experimental cycle path is made up of rows of solar cells, encased in concrete blocks. The road surface consists of a one centimetre thick translucent layer of tempered glass which is said to meet all (safety) requirements. A non-adhesive finish and a slight tilt so the rain can wash off dirt keep the solar panels clean so they can work as efficiently as possible. The path is now 70 metres in length, but will be extended to 100 metres in 2016. The cycle path in Krommenie is expected to generate between 50 and 70 kWh per m2 per year. This would be enough to power three households. The cycle path, which cost an impressive €3m, has been financed by the local government and Dutch companies who believe the project has economical potential. The Dutch media and public, who are usually very quick to voice any criticism, are overall optimistic. They hope ‘cycling is to become even more sustainable’ and are waiting for the test results to see whether the concept works. Outside Holland, the response has been sceptical if not outraged. British newspaper The Guardian wrote a positive piece about the experimental cycle path, but pointed out that ‘since the path cannot be adjusted to the position of the sun, the panels produce roughly 30% less energy than those fixed on the roofs.’ This triggered a heated debate as to whether roads are the best location for solar panels. The strongest critic of the solar cycle path is Craig Morris of Renewables International, who hopes that people will quickly realise how terrible the idea is, so that the project will not be copied elsewhere. Are solar cycle paths the way forward? It’s good to explore new technology and if the solar cycle path in Krommenie contributes to the development of more efficient, durable and affordable solar panels, who could be against it? However, many people – including me – wonder whether solar cycle paths and roads are the most economically viable option. Even if every suitable road surface would be used, it still wouldn’t be enough to supply every Dutch household with electricity. This article was first published on website Holland-Cycling.com.